Netflix, Amazon Prime Video or Hotstar – Which is better? India is the second largest and the fastest growing smartphone market in the world. Only a third of the huge 1.3 billion population currently owns smartphones and is connected online, in some form. No wonder every tech company sees a huge potential market and that includes video streaming services. These aren’t as mainstream in the country as in other parts of the world, yet, but competition for the top spot has already begun. Netflix, Amazon Prime Video, and Hotstar are the top names but which one should you really put your money in? Well, that depends, but if you know who you are the choice is pretty clear. Netflix is obviously the biggest name on a global platform among the three. Amazon Prime Video is a new entrant but is quickly gaining ground. Hotstar has been around before any of the others, although the premium membership program is fairly recent. Between the three, an Indian consumer probably has more choice of content than anywhere else in the world. The Indian video streaming market is valued at $280 million, with over 100 million subscribers already active on multiple platforms. 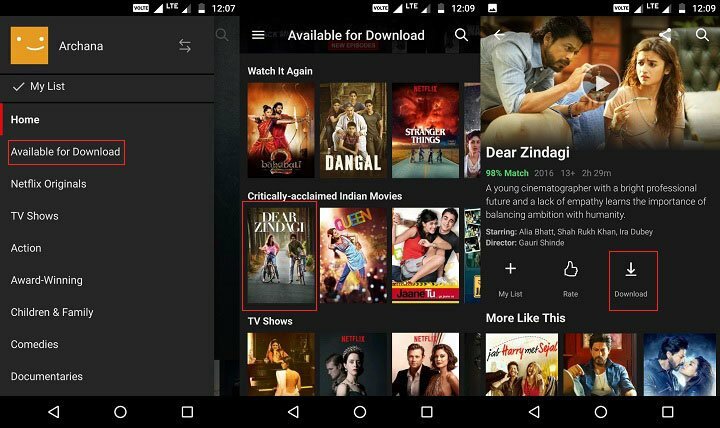 So let’s take a brief look at the three big video streaming services in India. As I said, it was the first so it makes sense to start with it. Hotstar is a video streaming service provided by Star India. It arrived with a different revenue model than Amazon Prime Video or Netflix. Whereas the other two are subscription-based services, Hotstar was a free advertisement based revenue model. The service was quick to include a subscription model as well as the number of users grew. Current estimates suggest it has about 75 million monthly active users, which is far more than any other such service can claim. Much of that may be due to the live streaming of Cricket matches. The service was also quick to buy streaming rights for globally acclaimed TV series ‘Game Of Thrones’ when it became apparent that it had a huge following in India. 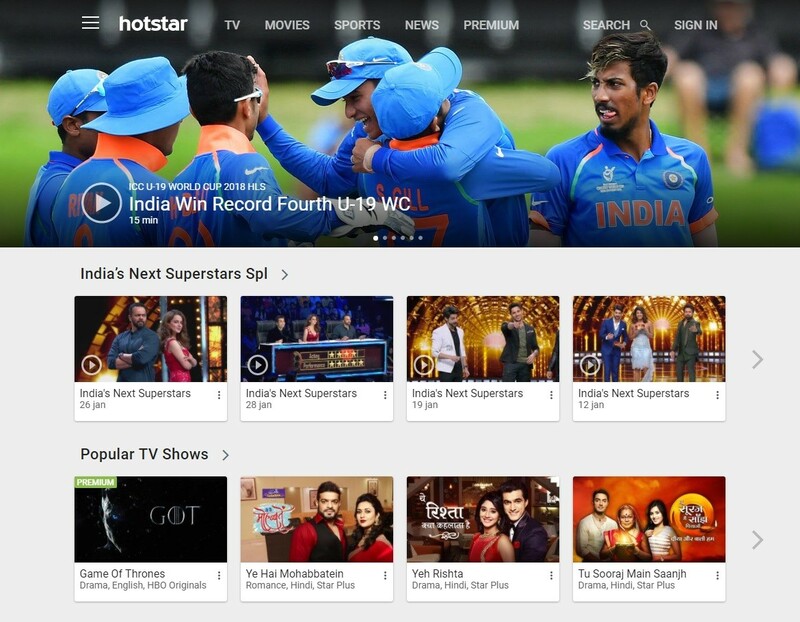 Hotstar has the largest library of regional and local content among the three. It is also adding international content at quite a rapid pace and Star India isn’t holding anything back as far as the cash flow goes. This shows because most of the popular English TV shows such as How I Met Your Mother, Grey’s Anatomy, Modern Family, etc. are available here. While you do need to pay for streaming premium content like Game of Thrones and most of the movies, a lot is also free on Hotstar, with ads of course. Only about 3 to 5 percent of its monthly active users have a paid subscription, in fact. Hotstar provides perhaps the biggest selection of content, and it is all available for ₹199 per month. It’s actually pretty cheap compared to what the rest of the world pays for similar services. Although, Amazon Prime Video is a lot cheaper. Amazon’s Prime Video arrived in India only by the end of 2016 in December. It’s the new kid in town, relatively speaking. That does not seem to hold it back though and Amazon is standing tall behind its video streaming platform. You get Prime Video for free, in a way, considering that you only pay for being an Amazon Prime member, and automatically get a Prime Video subscription for no extra costs. The company throws around a free subscription to its Prime services any chance it gets to sell you on a product. Sometimes with a new smartphone, often with its own Echo devices or Fire TV stick. The subscription costs used to be ₹500 per year but if you want a subscription now, you’ll have to shell out ₹1000 per year. Even with the increased prices, it’s still the cheapest of the three services. Not to mention you also get to enjoy free deliveries and other benefits of being an Amazon Prime member. So it is the cheapest, but it also has the least impressive content. Popular shows like Young Sheldon, The Mentalist, Supernatural, Grey’s Anatomy are here. But that’s about as popular it gets. Although where it shines most is in the selection of movies, especially Indian movies. Amazon is investing heavily in acquiring rights for new Indian movies and is also pumping in a lot of money behind Amazon Originals specifically made for Indian audiences. The service currently has 11 million subscribers and all of these are paid, meaning all those who enrolled in the free-trial have extended their subscriptions. The biggest name comes with the biggest price. Netflix is the only service among these three with a three-layered subscription. The basic, costing about ₹500 a month, only allows you to stream content in 480p. It also limits the number of screens you can stream on simultaneously to 1. A standard subscription will let you stream HD content on two screens simultaneously and it will cost you ₹650 a month. The premium plan lets you stream in 4K while increasing the number of screens you can simultaneously stream on to 4. It will cost you ₹800 a month. The costs are probably why it has the least number of users in the country. The global streaming phenomenon actually has fewer users in India than some of the less popular services such as Sony LIV which isn’t that big on content. For some reason, Netflix does not offer the popular TV shows and movies that it does in the west, which made it the name it is. Shows like Friends, The West Wing, The X-Files, Lost, Twin Peaks, etc. are nowhere to be found. In India, the best that Netflix offers are its own originals such as House of Cards, Daredevil, Stranger Things, Orange is the New Black, The Crown, Luke Cage, and Narcos. If English shows are what you’re after though Netflix has the largest collection. Netflix’s selection of Indian content is next to abysmal. Netflix Originals alone cannot justify the costs at all. This is why of the 5 million monthly active users, only 5 to 6 percent are actually paying for it. That is to say, hardly anyone is extending their subscription beyond the 30-day trial. Nokia smartphones are poised for a comeback after former managers at the Finnish company licensed the handset brand from Microsoft and struck up partnerships with Google and phone manufacturer Foxconn. Nokia was once the world’s dominant cellphone maker but missed the shift to smartphones and then chose Microsoft’s unpopular Windows operating system for its “Lumia” range. It’s difficult to tell when you’re in the midst of a landmark moment in history. Few guessed that in 2008 when Google debuted the G1, the first phone to run Android, the mobile software would transform the wireless world. It didn’t help that when Google co-founders Larry Page and Sergey Brin went up on stage, they were wearing roller blades. Packing a Snapdragon 821 chipset, 4GB of RAM, 32 or 128 gigs of native storage, and finally, a camera that is allegedly among the best ones in the class, the Google Pixel and Pixel XL are here to wage war on the very best the Android market has to offer. Forget December Lumia 950XL production has already stopped. What went wrong? Remember the reports of Microsoft ending Lumia production by the end of the year? The speculations just got a boost today from a report out of the U.K. Winbeta reports that a user in UK has been refused a warranty replacement for his Lumia 950 XL because Microsoft had no further stock of the device, with all remaining units already sent to distributors. Production of the handset has reportedly stopped a month ago already.